Subject of science fiction or right around the corner? Most people would like to take a trip to the moon if it were within their power to do so. Riding a shuttle through space is already becoming a near-future reality in the form of space tourism. The next step of that project is to have moon fly-bys and, no doubt, eventually moon landings. But shuttles are expensive and it’s not likely to happen soon, even if technology progresses steadily. 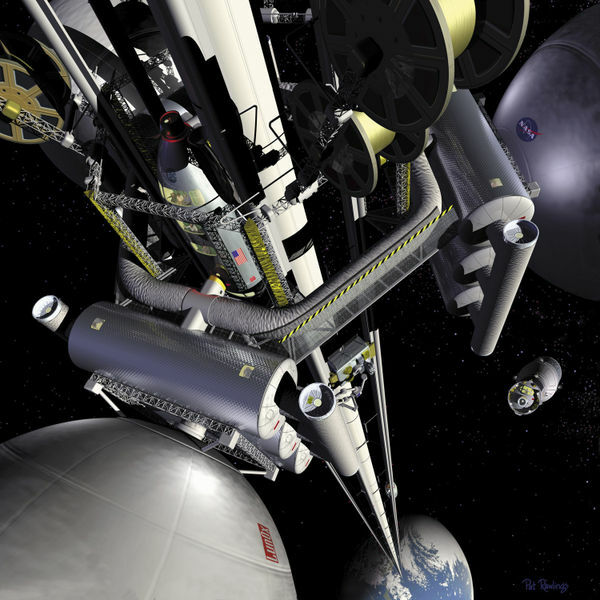 Some people are looking at an alternative to shuttles, however, in the form of a space elevator. Though it would not take average people to the moon anytime soon, if what one person says is correct, the implementation of a working space elevator might be just around the corner. The space elevator is a theoretical structure that basically uses a cable to attach a planet, such as the Earth, to a fixed point in space. The cable can then be used as a track of sorts to move mechanisms up and down from the planet and into space. The technology to build such a thing is way out of reach and the complexities of making it enormous. LiftPort Group, a company headed by former NASA researcher Michael Laine says that the answer to the problem might be solved by making the elevator start on the moon instead of Earth. Due to several factors, such as the lessened pull of gravity on the moon, materials already available can be used to create this space elevator. LiftPort is currently using Kickstarter to gather funding to the project, starting with a meager $8000 goal for its first stage with plans to work their way up to $3 million for preliminary testing. According to Laine, if the funding were completely available, the space elevator could be built within eight years. In the end, however, the structure would cost an estimated $800 million - no small bit of change. This may sound like far-fetched science fiction, but LiftPort isn’t the only one looking to try their hands at a working space elevator. Two other major companies also have projects going, though don’t have to rely on Kickstarter for their funding. With any luck, the problems behind building this wonder of Earth can be solved and we, as a species, may be looking at a home that consists of two planets instead of one.